Mort Rosenblum "Little Bunch of Madmen"
Mort Rosenblum’s passion for reporting is infectious. For 40 years he has covered war and peace on seven continents: civil strife, velvet revolution, climate chaos, and the rest. As Associated Press special correspondent, he’s been shot at, locked up, lied to and shaken down. He ran AP bureaus in the Congo, West Africa, Southeast Asia, Argentina, and France. As editor of the International Herald Tribune in Paris, Rosenblum dispatched correspondents and decided what made news. Now, in vivid detail, he explains what he learned the hard way in this gem of a guide to global reporting. 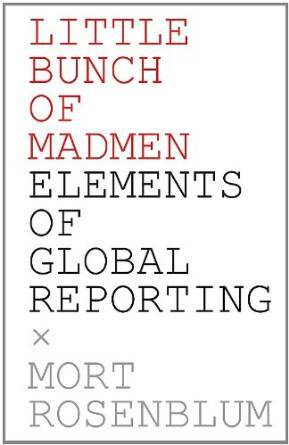 Rosenblum draws on his own experiences and interviews with legendary journalists he has admired to create this unique field manual for global reporting. Seasoned hands like Christiane Amanpour, Jon Lee Anderson, Edward Cody, Jerome Delay, Ryszard Kapuscinski, Gary Knight, Vaiju Naravane, Remy Ourdan, Alison Smale share insights on how to find the story and overcome adversity (including editors) to bring it home safely. They talk about when to team up and when to venture off after a scoop that matters. Reporters will prize the hard-won, practical advice in Little Bunch of Madmen, such details as how to pack, interview, and make connections. But beyond these basics, it helps all readers to cross cultural bridges and find the vital human context that underpins good reporting.